At the time of the Mishna (200 CE), rabbis deemed it meritorious to eat fish on the Sabbath and Jews became accustomed to eating fish at festive meals. Due to the plethora of rivers in Europe, Ashkenazi Jews tended to cook with freshwater fish. Eastern European Jews would make a mixture of chopped fish, stuff it back into the skin of the fish, and boil it. The word gefilte means stuffed in Yiddish. 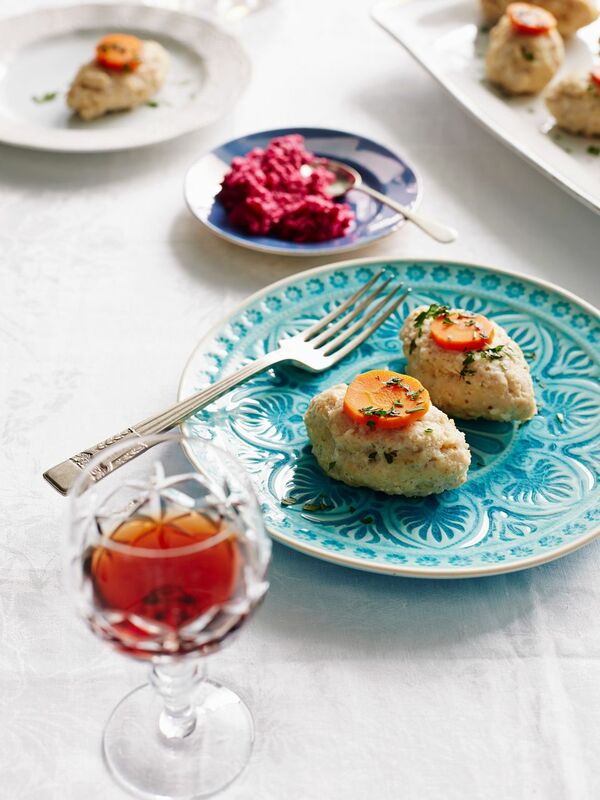 Gefilte fish is a loaf of chopped up fish, usually white-fleshed freshwater fish such as carp or pike. The chopped fish is generally mixed with onions, carrots and parsley. Eggs and matzah meal hold the mixture together. Below are ingredients for gefilte fish. Saute 1 onion in 2 tablespoons oil, and set aside to cool. In a food processor, grind the fish and set aside in a large mixing bowl. Grind 2 carrots, 2 parsnips, 1 onion, 8-9 garlic cloves, and parsley. Add the fried onions and matzo meal to the ground fish. Add the ground vegetables to the fish batter. Add the eggs, spices, and enough oil for mixture to hold together nicely. Mix well. If time allows, cover the fish batter and store in the refrigerator for an hour or two. 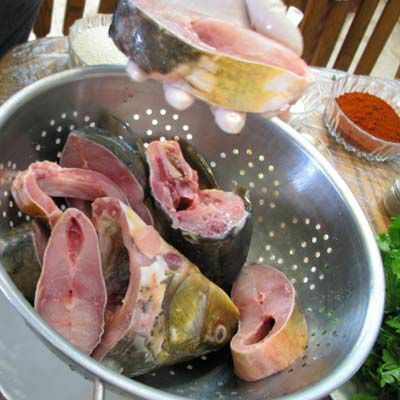 If desired, you can use the fish stuffing to stuff fish heads or pieces of fish. Use the rest of the stuffing to form fish balls. In a large soup pot, mix together the ingredients for the fish stock. Add water and bring to a boil. Remove the fish carefully from the stock onto prepared pans. Pour some fish stock on the fish. Slice carrots from the stock, and place a piece of carrot on each piece of fish. Let the fish cool. After the fish has cooled, cover and store it in the refrigerator until ready to serve. This fish also freezes well. If you freeze the fish, be sure to boil it again, then chill and refrigerate before serving.